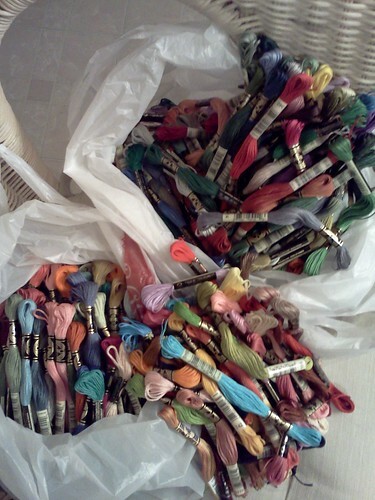 Posted on November 16, 2012	by Alice C.
A couple weeks ago, I suddenly decided I needed to own every color of DMC embroidery floss — all 450+ of them. For some reason, my husband did not try to stop me. As a budding designer, I justified it to myself as necessary to the design process. One simply cannot rely on a computer monitor or printed color card to understand how different colors of thread are actually going to work together in a pattern. I want to see the floss. I want to hold the skeins in my hand and compare the colors. I now am in the process of organizing all these threads in some useful way, so I can find what I need, when I need it. I will share my method of organization in a future post. This entry was posted in Cross-Stitch and Needlework and tagged cross stitch, dmc, embroidery thread, floss. Bookmark the permalink.